"Focused Inbox intelligently presorts your email so you can focus on what matters. It places your most important emails in "Focused" and the rest in "Other." Focused Inbox works across all your email accounts, personal and professional. To create an inbox that "feels right" to you, the system takes into account emails and contacts with whom you interact, and filters out noisy sources like automatically generated or bulk email. The more you use it, the better it gets. You can easily reclassify emails between Focused and Other. Just open an email, then select "Move" from the drop-down menu." Follow these steps to disable the Focused Inbox feature. 1. Tap Settings in the menu bar at the bottom of the screen. 2. Toggle Focused Inbox off. 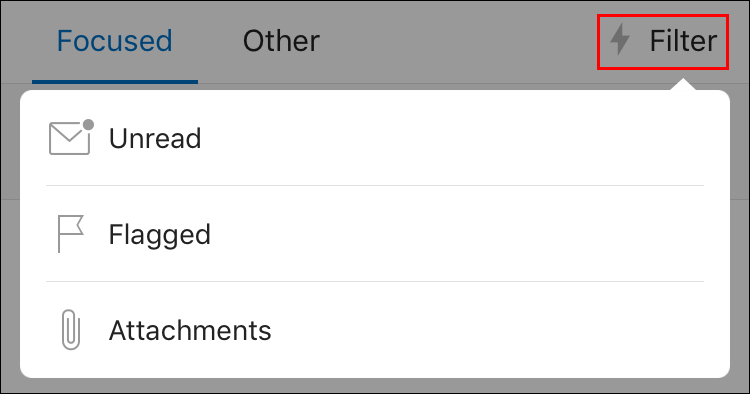 You can also use the Quick Filter feature to sort items in the following ways: Unread, Flagged, or Attachments.